What does a Van Morrison classic, the UPS truck, an NFL team from Cleveland, and a lunch sack have in common? I’ll give you a hint. It’s not that the UPS man likes to listen to oldies while delivering lunch to the practice squad. It’s that they share a common relationship to the color brown. Each of the ideas found on this page also has a similar bond. The list is composed of names for the dog with a brownish coat. In order to match up to a variety of hues, we have included many shade based choices like Russet, Sienna, Copper, and Sandy. While deriving from common names for colors that share a similar wavelength and frequency is a popular approach, some will find this dull and seek something more fulfilling. This is where other things that share a place in the spectrum come into play. Chocolate and coffee are typical selections. For chocolate lovers we recommend Coco, Hershey, or Snickers. The coffee cultist might find Mocha, Latte, or Java fitting. Other clever options like James, Charlie, and Foxy come from famous people that have the last name Brown. These and many more sources are used throughout this collection. Our goal here was just to get the wheels spinning in the right direction. If you come up with a fitting option that isn’t on the page, please share using the suggest feature so that others may benefit. Some of our pages will contain a subcategory. A subcategory is a slightly more specific grouping than the main topic of the page. For a subcategory, we will include a separated table of names and corresponding descriptions. 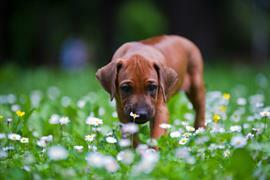 An example of a subcategory of Red Dog Names would be 'Dog Names Inspired by Red Wines'. If you have any subcategory ideas for the Brown Dog Names page, we would love to hear them. Use the form below to submit your ideas.